Samuel Saiz has become Leeds United’s seventh summer signing after completing his long-awaited transfer to Elland Road. Saiz signed a four-year contract this morning, completing a £3m transfer from Huesca and ending a protracted battle for his signature. Leeds have beaten several La Liga clubs, including Eibar, Alaves and Real Betis, to his signature having moved for the attacking midfielder at the end of the Spanish season. United worked through weeks of complex negotiations to reach a deal with Huesca and finalised the move today having flying Saiz into England for a medical on Monday. Leeds had initially hoped to unveil Saiz on Tuesday but the move was delayed while the club ironed out a handful of remaining issues. Saiz, a former Real Madrid trainee, starred in the Spanish second division last season, scoring 12 times from midfield to help Huesca to the play-offs. 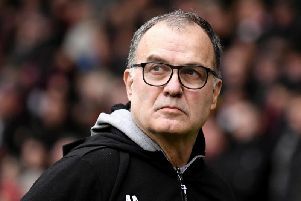 He will fly with Thomas Christiansen’s squad for their pre-season tour of Austria tomorrow and his arrival looks set to be followed by a deal for Lugano winger Ezgjan Alioski. Leeds have been targeting Alioski for the past month and sources close to the Macedonia winger expect him to undergo a medical with United in the next 24 hours.